This is kind of a continuation to my last posting. I still spent most of the time for the project on doing content. That’s the thing about creating games that I really like, as it doesn’t only mean to write code but also to do a lot of differen things like creating graphics, models, writing a stroy and stuff. So right now I’m more in a mood to create content and that’s exactly what I’m doing. As I may have told earlier (don’t remember) the game will have 5 different nations you can choose from. and the stories as well as the flags for those nations were amongst the first things I created back in 2003 for the first prototype, so I sat down and rewrote the background stories for all nations, which are now far more detailed and also have something in common amongst all nations. In addition to that I also remade the flags for four of the nations (the first one already looked good enough), which now look a lot better. Though writing the new stories and especially creating the new flags took a lot of time, but I had a lot of fun doing it. See the shot on the left for a preview of those flags, with the new ones being on top and the old ones being at the bottom. 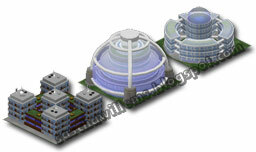 And I also created some new buildings, this time it’s three residental buildings. See the shot, they’re all in-game rendered (via the 3D preview in Weltedit) and are already implemented into the game. So together with the other eight buildings from the last post I’ve already done elven buildings. But there’ll be a lot more in the game, so there’s still some work ahead on this part of the game’s content.